The size of a cell's nucleolus may reveal how long that cell, or even the organism that cell belongs to, will live. Over the past few years, researchers have been piecing together an unexpected link between aging and an organelle typically known as the cell's ribosome factory (or perhaps just a blob in the middle of the nucleus). A May 17th review in the journal Trends in Cell Biology outlines the connections between the nucleolus and age-related pathways—such as those associated with dietary restriction or progeria. "The nucleolus is perceived as a basic housekeeper: It's responsible for producing ribosomal RNA, which is important for the synthesis of proteins that are essential to the vitality of the cell," says Adam Antebi, director of the Max Planck Institute for Biology of Ageing in Germany, who co-authored the review with postdoctoral fellow Varnesh Tiku. "But our work and other people's work shows that the nucleolus plays many different roles, including lifespan control." Studies of aging and the nucleolus have been carried out in yeast, worms, fruit flies, mice, as well as early data in humans undergoing dietary restriction and exercise. Worms are particularly useful for aging research because they only live for about a month, so it's possible to tweak their genomes and see what extends or shortens their lifespans. Antebi and others have seen that common pathways related to aging ultimately affect nucleolar size—organisms with enlarged nucleoli have shorter lifespans and those with shrunken nucleoli have longer lifespans. Many of these longevity pathways converge on a nucleolar regulating gene called NCL-1. 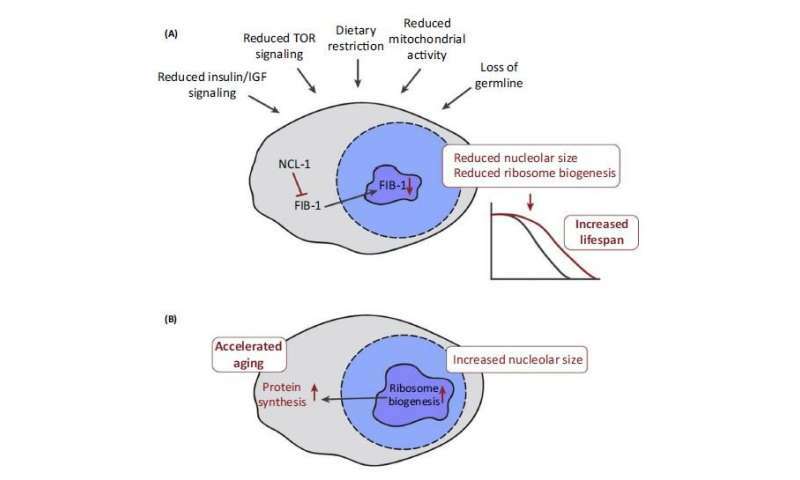 Dietary restriction, reduced insulin signaling, and other lifespan-extending interventions increase the activity of NCL-1, reducing nucleolar size and the creation of ribosomes. Worms lacking NCL-1 receive no age-extending benefits from these therapies. Relatedly, people with diseases such as cancer or progeria that accelerated aging have enlarged nucleoli with increased ribosome biogenesis. It is still unclear why a small nucleolus can extend lifespan, but it may be linked to balancing cellular renewal and repair. "Within an organism, within different tissues, it's for sure that nucleolar size can vary quite a bit depending on the metabolic activities of the cells, so for example, in C. elegans, neurons have very small nucleoli whereas they are quite big in skin cells or muscle cells," Antebi says. "It turns out that neurons in C. elegans maintain their structure well into old age, whereas muscle cells and skin cells tend to deteriorate more rapidly in the organism. Thus, even within an organism different tissues have different nucleolar size and it may reflect different rates of aging." Does this mean that the nucleolus acts as a kind of cellular timer? Not quite. Antebi argues that the organelle—which lacks a membrane and has a unique biochemistry that keeps it separate form the nucleus—is more likely the center for growth control. Too much growth and cells turn cancerous, too little and tissue repair becomes dysfunctional. "The nucleolus is such an important organelle, it's what has been selected to coordinate all of the different informational processes in the cell that bring protein and RNA together," he says. "What is life but the proper processing of information and responding to environments in ways that are healthful for the cell and organism." Antebi is interested in learning more about whether the nucleolus is acting on specific age-related pathways or if the organelle has a global effect on organism-level physiology such as immune function or metabolic regulation. The work also raises the possibility of the nucleolus being a biomarker to monitor the health or longevity of organisms, and a pilot experiment in humans supported this potential. "What if? Perhaps it's a bit of a stretch, but it's an intriguing idea," he says.